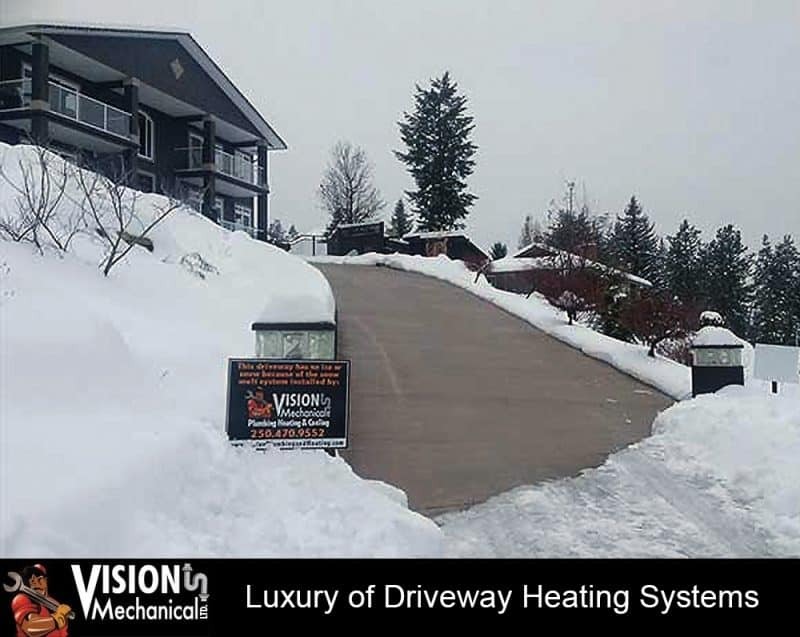 Luxury of Driveway Heating Systems | Vision Mechanical Ltd.
As snow piles up on your driveway, shoveling can become a real pain. A homeowner either needs to do dig out shovels and exert physical energy or pay someone to do it for them. After a while, both outcomes are draining physically and/or financially. Technology has done wonders for us over the years by coming up with an amazing solutions. You can now have the luxury of installing heated driveways. As the name suggests, the basic concept revolves around keeping the pavement warm enough to melt falling snow and stop it from accumulating. There are two types of heating systems that work by generating radiant heat underneath the driveway. Radiant heat keeps the driveway warm, stopping snow from accumulating. The first heating method uses an electric current to generate heat on a wire or across a mat. The method closely resembles the same manner as most indoor floor-heating systems. The second method uses a series of tubes and pumps to move hot water directly underneath the driveway to warm it up. The luxury of snow removal without having to go out and shovel it yourself. Yes, snow removal is the main benefit, but that is not all. Heated driveways also prevent ice accumulation during freezing rain or chilly nights after warm, rainy days. Eliminates slipping on ice walking to your car much less dangerous. It also removes the need for salt or other snow removing chemicals that ultimately damage the asphalt below. Heated Driveways is an long-term investment. The materials are on the high end, installation, operation and maintenance all add up. It all depends what options are available to you to install a driveway system. You will need to demolish an existing driveway to install the heating system. To find out your options to install a heated driveway for your home, contact Vision Mechanical to provide a quote. Installing a heated driveway is best installed by professionals. The process is a complex, long, tiring, and draining experience to try and tackle yourself. Especially when you need to consider having to destroy your preexisting driveway. Professional installers have much more experience with heating systems. They are also more proficient in removal and reinstallation of the actual driveway. Using the services of a professional also provides peace of mind when it comes to the installation system working correctly. There is an alternative to heating systems embedded underneath your driveways. You can place heated mats over your driveway, entrances or sidewalks to prevent snow accumulation. Prices vary based on the size of the mat, with larger mats costing upwards thousand dollars. Yes these options are expensive. When you weigh the fact you will not have to leave your home to go out in the cold and shovel, the luxury of heated driveway all seems worth it.